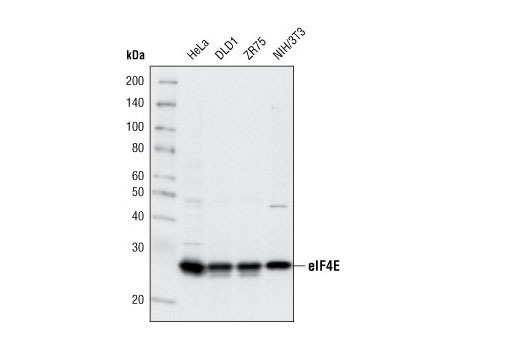 Western blot analysis of extracts from various cell lines using eIF4E (C46H6) Rabbit mAb. Western blot analysis of extracts from HeLa cells, transfected with 100 nM SignalSilence® Control siRNA (Fluorescein Conjugate) #6201 (-) or SignalSilence® eIF4E siRNA I #6311 or SignalSilence® eIF4E siRNA II #6554 (+), using eIF4E (C46H6) Rabbit mAb #2067 and α-Tubulin (11H10) Rabbit mAb #2125. 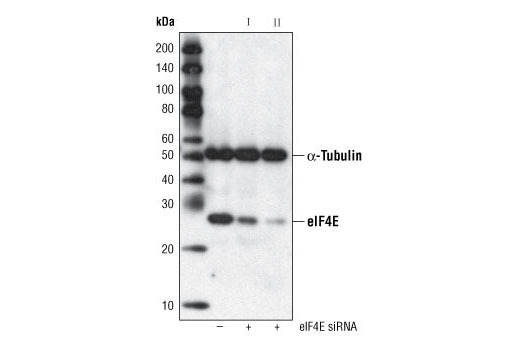 The eIF4E (C46H6) Rabbit mAb confirms silencing of eIF4E expression and α-Tubulin (11H10) Rabbit mAb is used to control for loading and specificity of eIF4E siRNA. 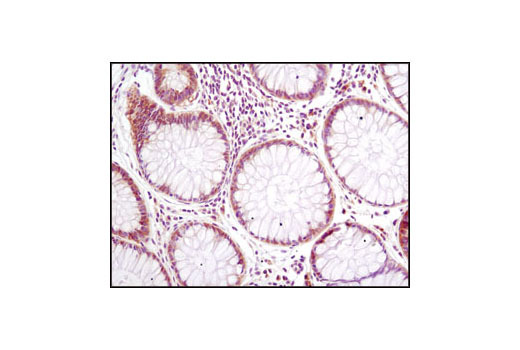 Immunohistochemical analysis of paraffin-embedded human colon carcinoma using eIF4E (C46H6) Rabbit mAb. 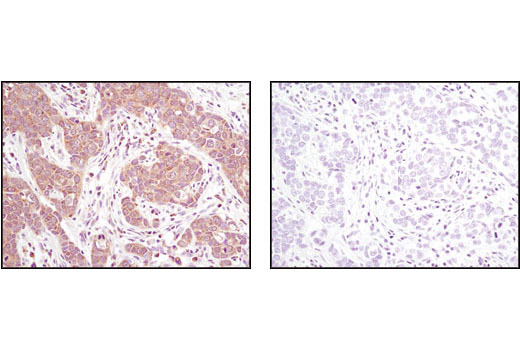 Immunohistochemical analysis of paraffin-embedded human breast carcinoma using eIF4E (C46H6) Rabbit mAb in the presence of control peptide (left) or antigen-specific peptide (right). eIF4E (C46H6) Rabbit mAb detects endogenous levels of total eIF4E protein. Monoclonal antibody is produced by immunizing animals with a synthetic peptide corresponding to human eIF4E protein.